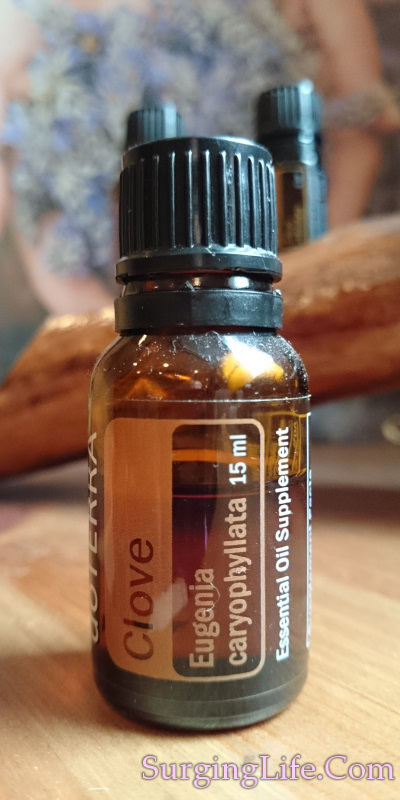 Clove Essential Oil is derived from the clove plant, Syzygium Aromaticum, also known as Eugenia Caryophyllata amongst other terms. It has good anti-septic, anit-viral and anti-bacterial properties, plus has very high levels of anti-oxidants, as such making it a powerful healer. You can discover about Clove Essential Oil Uses further below, there is a lot to this healing oil. The plant itself, Syzygium Aromaticum or Eugenia Caryophyllata, is a native of Indonesia. Though it is now grown in Madagascar, the West Indies and the Phillipines amongst other places due to their similar climates. The tree itself is an evergreen which can grow to 12 meters in height, which is a relative of the Eucalyptus and Tea Tree (Melaleuca), and has large leaves. The cloves themselves are the unopened buds of the tree, which are the only part that should be used for the extraction of Clove Essential Oil. The reason for this being the levels of Eugenol present in the leaves, stalks and stems. Whilst the Cloves, or buds, also have fairly high levels the also have other constituents that balance and aid in safe delivery of the Eugenol contained within. As such it is wise to check the source parts used in the essential oil you are thinking of buying, very high levels of Eugenol in an unbuffered state can cause strong irritation. The oil is collected via steam distillation, for which the only part of the plant used to make a high quality oil should be the buds or cloves. The aroma is that of a middle note, with a spicy, woody and warm character, with a slightly fruity hint to it. It can darken and thicken with age following exposure to air, though initially it is golden yellow to brown in colour and clear in nature, with a medium or slightly oily viscosity. The principal consituents that yield its properties are Eugenol, Eugenyl Acetate, Caryophyllene and Isocaryophyllene. Note has been made of the anti-oxidant properties of this essential oil, clove's ORAC (Oxygen Radical Absorbance Capacity) rating is 1,078,700 µTE per 100g. As a point of contrast Blueberries, which hold one of the highest ORAC ratings for foods, score around 2400. Blueberries are widely known to have high levels of anti-oxidants, though one drop of clove oil yields over 400 times their count. When using in contact with skin use in a 1% dillution. This is due to the levels of Eugenol and its ability to cause irritation. Antimicrobial activities of Eugenia caryophyllata extract and its major chemical constituent eugenol against Streptococcus pneumoniae. "In this study, we investigate the antimicrobial activities of both Eugenia caryophyllata (Ec) extract and its major component eugenol (4-allyl-2-methoxyphenol) against Streptococcus pneumoniae... Eugenol at a concentration of 0.12% completely killed S. pneumoniae within 60 min of exposure. The kill rate of planktonic cells was most rapid during the first 15 min of contact with eugenol. The addition of eugenol or Ec extract inhibited in vitro biofilm formation. In already established biofilms, the inhibitory effect of eugenol or Ec extract was more significant in terms of cell viability than in terms of disruption of the biofilm matrix... In conclusion, eugenol and Ec extract efficiently inhibited S. pneumoniae in planktonic growth and within biofilms." Yadav MK, Park SW, Chae SW, Song JJ, Kim HC. Clove essential oil uses bring strong benefit to internal health for a variety of reasons. It is strong as an antibacterial, antifungal and antiviral, dealing with a wide range of each with great ease. Its power as an antioxidant is incredible. Potency as an antioxidant is measured by the ORAC standard, whilst Blueberries which are fabled as good antioxidants have a value of 9,019µTE/100g, Clove essential oil's value is 1,078,700 µTE/100g, potentially the strongest available. Probably one of the best things about Clove oil, as mentioned above, is its antioxidant value 1,078,700 µTE/100g versus 9,019µTE/100g for Blueberries and 14,582µTE/100g for Prunes. Something which truly makes getting a high quality source which is safe for internal usage very worthwhile. Having a drop in a vegetable capsule, in cooking, or in a drink each day can really bring a big boost to your health levels. It is also a great tonic and as a stomachic it improves stomach function, and can also help to protect against stomach ulcers. The warming action of Clove oil, along with its anti-inflammatory action bring benefit to those treating Arthritis and Rheumatic conditions. The oil helping to soothe the inflammed nature of the condition where it is applied, warming through the joints and helping tissues to achieve a greater degree of health. In addition to this its analgesic action helps by reducing any sensations of discomfort in the areas where it is applied. Another way Clove essential oil can be used is in keeping moths out of clothing in storage. By placing a few drops on cotton balls, then placing the cotton balls safely in your closet, or wherever, will help to keep the location clear of moths. Clove oil benefits run through a myriad of things that help your health. It is very good as an antibacterial and antiviral. It boosts your immunity and overall health. It benefits the digestive system, especially the stomach. Plus it has huge benefit as an antioxidant, far beyond a plethora of foods that are considered good in that way. To truly get the best in terms of all the Clove essential oil uses make sure you are using a high quality source of the oil, one that has been stated as being safe for internal usage. In doing so you open up your opportunity to get the best results and to being able to use this oil in the most beneficial ways. Check out the guide on how to buy good essential oils, it will help you to get the quality that bring the best in all you do with oils.